Lifeline® Human B Cells (HBC) provide a source of human antibody-producing cells. HBC contain B cells from the circulation with a variety of antibody specificities. HBC are used for antibody production, studies of antigen presentation function and many other facets of immunology. Lifeline® HBC are cryopreserved immediately following purification from human peripheral blood mononuclear cells. 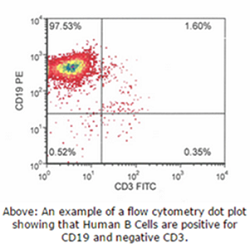 Our HBC are quality tested via flow cytometry to ensure proper expression of CD19 and depletion of undesired cell types. HBC express CD19 but lack CD3, CD14 or CD56. Lifeline Cell Technology provides products using the highest quality raw materials and incorporates extensive quality assurance in every production run. Exacting standards and production procedures ensure consistent performance.